Is there a shoe that fits comfortably on a sensitive baby’s foot and also provides optimum securing of the foot? Our answer to this is the COMFOOT bandage shoe. 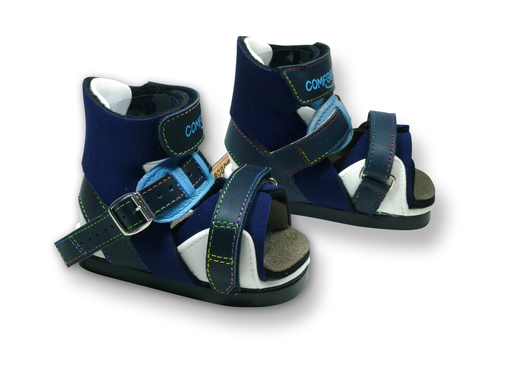 This innovative shoe concept was developed together with specialist doctors and technicians. It combines a designed and antibacterial upper and forefoot model, with an elasticated bandage material. The result is an improved shoe that fits each individual child’s foot. The bandage shoe is available in two different model varieties, with a choice of COMFOOT-Blue shoe or COMFOOT-White shoe. All models fit the ALFA-Flex and BETA-Flex braces. Please note: These are not “real” orthopaedic shoes, i.e. they are not suitable for walking since they have a fixed, smooth sole. 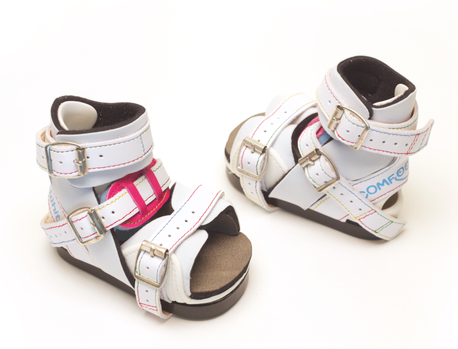 The shoes are simply a fastener for the feet to be fixed to the brace. On their own, without the brace, the shoes have no medical use. The bandage material provides an excellent, comfortable fit and securely fastens small feet. Quick to put on thanks to clip fasteners. Ideal for particularly narrow feet that perspire heavily - thanks to a secure upper and insole with antibacterial properties. Insole with side wings that also fit narrow feet well. Trimmable wings for wide feet.